There is no doubt that Android numbers are the ones to beat in the U.S. Google’s mobile platform accounts for more than half of all smartphone sales here, with 51.2 percent marketshare. A year ago, it was 45.4 percent. That’s not a massive surge, but it’s still enough to beat iOS, which didn’t grow at all. It actually went down, from 47 percent to 43.5 percent. Now, you could look at this in different ways. Yes, the Android platform is obviously ahead of the iOS platform. And yes, apart from legacy devices, you’re looking at a fleet of Android phones versus one iOS handset. But if you believe Yankee Group’s latest smartphone survey, none of that may matter much in the near future. According to the report, loyalty will drive iOS to the top of the U.S. market in a couple of years, and that would mean that both the iPhone as an individual device and the platform as a whole will take the lead. In this survey — which polled 16,000 consumers over the last 12 months — roughly half of the smartphone owners who participated were Android users, while only 30 percent owned iPhones. But for those who planned a new smartphone purchase in the next six months, both platforms were equally attractive, nabbing 42 percent each. Things look even better for Apple when loyalty comes into play. Yankee found that 91 percent of the iPhone owners planned to stick with the platform, losing just six percent to Android. Meanwhile, the competition retained 76 percent of its users. And of the 24 percent who intended to leave, 18 percent said they were going to iOS. 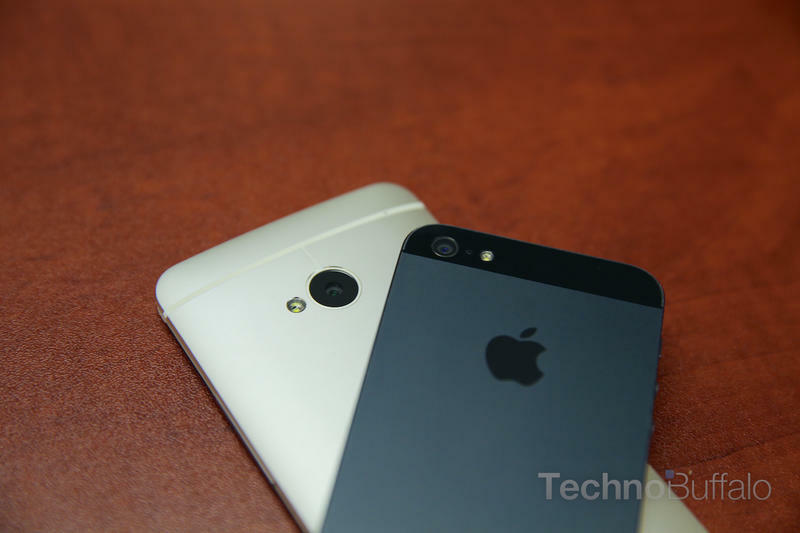 In other words, the report says that Android is peaking, while iOS will only grow further. By 2015, it will dominate the U.S. market. Think of the Apple and Android ecosystems as two buckets of water. New smartphone buyers — mostly upgrading feature phone owners — fall like rain into the two big buckets about equally, with a smaller number falling into Windows Phone and BlackBerry buckets. However, the Android bucket leaks badly, losing about one in five of all the owners put into it. The Apple bucket leaks only about 7 percent of its contents, so it retains more of the customers that fall into it. The Apple bucket will fill up faster and higher than the Android one, regardless of the fact that the Apple bucket may have had fewer owners in it to begin with. Samsung’s Radio City Music Hall launch of its Galaxy S IV smartphone made good headlines, but consumer buying data shows that at the checkout counter, Apple continues to eat Samsung’s lunch. Apple’s “black hole” ecosystem captures subscribers who never leave, while Android smartphones are losing one out of every six customers to other manufacturers. 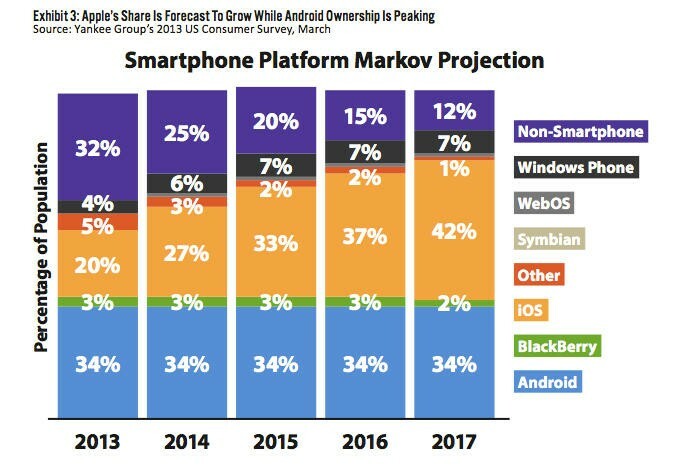 These trends will drive Apple ownership well past Android ownership by 2015 and will reinforce Apple’s dominance in tablets as well. Of course none of this takes into account what Apple may announce this year. Whether iOS 7 and the new iPhone wow or disappoint the public could impact these numbers, and during a time when Android is showing real maturity in the Galaxy S 4 and the HTC One. But either way, it looks like the next year or two will be a critical period that may finally determine the winner in the platform wars.